In the Christian Year November is that special time when we reflect on aspects of the Kingdom and of our King, Christ, whose rule lives in the hearts of His people. As it is a spiritual realm Christ's kingdom is often referred to as a kingdom of grace. However unlike earthly rulers who are often tyrannical, Christ does not command but gently shepherds His citizens to follow His precepts and example. Like all kingdoms there are rules by which we live. I am going to write about one of those, imitatio Christ. When the disciples asked our Lord 'why do the disciples of John fast often, and make prayers but you eat and drink?' one of the replies our Lord gave was, 'no man puts new wine into old bottles, else the new wine will burst the bottles but new wine must be put into new bottles." (Lk.5.33-39). What our Lord was indicating to His disciples in his answer was that His coming has brought a new way of life, much more demanding than that under the old Covenant. We only have to focus on such sayings of our Lord as the following to realise this: 'Learn of me who is humble and gentle of heart;' 'Take up your cross and follow me;' and 'Love your enemies'. When the Church Fathers taught on conformes imagini Christi there were particular aspects of Our Lord's life that they especially emphasised for Christians to imitate. 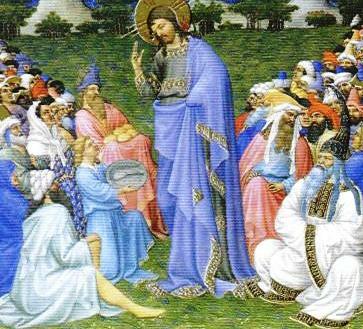 One is Christ's obedience to His Father, vividly manifested in the garden of Gethesemane. As Christ obeyed His Father while here on earth, so "there must be an imitation" by Christians in order to "set ourselves forward to our heavenly country." Another is Christ's overcoming Satan's subtle temptations. We too have to say, "Get thee behind me Satan!" After all "it is the devil's occupation to defame us first with God," which "was the cause of all sin." Yet another is Christ's prayer life. From Him we learn that we can pray anywhere, and under any circumstance or difficulty. However the most accentuated aspect of Christ's life to be imitated is bearing the Cross. Calvary is the true "'pattern,' and example to follow." It is "to this, He calleth us; to have a directory use of it, to make it our pattern, to view it as our idea." There is no other precept needed but to "see and do according to the theory shewed thee ... in Mount Calvary." From the cross Our Lord manifested all those virtues we should emulate: faith, perseverance, patience, humility, meekness, gentleness and above all love. To imitate Christ is no easy task. To live this way is essentially a miracle of grace. It cannot be achieved any other way; even our best endeavours are not sufficient. We shall sin, we shall fail, we shall flounder, we shall not resolve problems and difficult situations unless grace nourishes and sustains us. St. Paul tells us "sin abounds" but he also tells us that "grace superabounds". In that we take heart. Yes, we take heart but grace has to be sought. To follow Christ's way takes more than a lifetime to achieve. It means spending our time at His disposal, allowing our beings to be receptive to the Spirit and the ways of God; pondering His teaching in daily reading of Scripture, of daily examining our consciences, of receiving our Lord in the Sacrament regularly, of listening to God in the quietness of our soul and simply soaking in His presence each day. 'Be still and know that I am God' and that I am here in your midst, however lonely and heavy, and I am ready to give you My help. That is grace. And through that grace we shall recognise that in every situation, however dark, desperate and difficult God is there, and He wants us to be like His Son, and to act as Love should. This usually involves going the extra miles, turning the other cheek and embracing the 'unlovable'. Another source of inspiration to be Christ-like is to reflect on the lives of the saints as they have striven in all kinds of difficulties to follow Christ's way, often being faithful to Him unto death in the face of enemies. Have you ever pondered how joyful joy those early martyrs (men and women and children) were as they went to their deaths (one of course was St. Ignatius about whom I wrote last month)? Furthermore this joy and love towards their enemies converted many to Christ and the Faith He taught. And so should we by the way we live. May the saints inspire us and pray for us to follow Christ's precepts of His kingdom. Quotations used are from Andrewes' sermons.